Description: Sweetland. Here is a postal card entitled "Pennsylvania 6755." No Postmark. Caption On Reverse: "M-1 6755 is in charge of this Northumberland to Enola freight on August 26, 1956. The 4-8-2 bustles over the Susquehanna River Bridge as it heads out of the yard. Photographer: David R. Sweetland." #6755 is an M-1B (4-8-2) "Mountain" built by the Baldwin Locomotive Works as an M-1A during June of 1930, rebuilt in Juniata as an M-1B in April of 1944, and is presently on display at the Railroad Museum of Pennsylvania in Strasburg. Description: Coal Power. Here is a duplicate 35mm color slide by an unidentified photographer that was taken in Northumberland, Pennsylvania, during August of 1963. 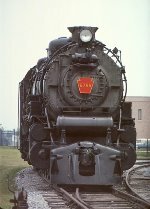 Shown here is Pennsylvania Railroad engine #6755, an M-1B built in Juniata as an M-1A during 1930, rebuilt in Juniata as an M-1B in April of 1944, retired in August of 1957, and presently on display at the Railroad Museum of Pennsylvania in Strasburg. Description: RRMP. 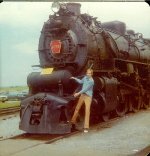 Here is an original photo that I took at the Railroad Museum of Pennsylvania in Strasburg, Pennsylvania, on 30 June 1973. 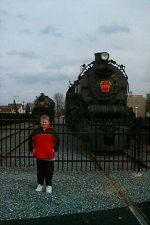 Shown here is Pennsylvania Railroad steam engine #6755, an M-1B (4-8-2) "Mountain" built in Juniata during 1930. Description: 90 on the left on the excursion train, the 2846, 6755, & 5741 were on diisplay here, along with obs. "Paradise"
Description: PRR M1B 4-8-2 6755 rests outside the RR Musuem of Pennsylvania in Strasburg, PA on July 4, 1977. 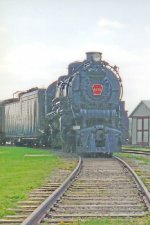 Description: PRR M1B 4-8-2 6755 and E-7A 4201 rest outside the RR Musuem of Pennsylvania in Strasburg, PA on July 4, 1977. 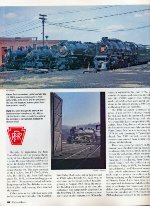 Description: Here is page five of a six-page cover article by Robert Emerson & Kurt Bell entitled "The Pennsylvania Railroad's Historical Collection." It was published originally in the Fall 1996 issue of "Vintage Rails," page 84. Top Photo by Bill Volkmer (1965). Shown here (L to R) are PRR engines #1670, #94, #460, and #6755; all are presently on display at the Railroad Museum of Pennsylvania. #1670 is a B-6SB (0-6-0) switcher built in Juniata during 1916. #94 is an A-5S (0-4-0) switcher built in Juniata during 1917. #460 is an E-6S (4-4-2) "American" built in Juniata during 1914. #4755 is an M-1B (4-8-2) "Mountain" built in Juniata during 1930. Bottom Photo by Richard E. Bradley (1957). 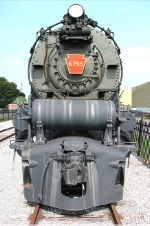 Shown here is PRR engine #559, an L-1S (2-8-2) "Mikado" built in Juniata during 1914 and retired in August of 1959. Description: PRR Mountain 4-8-2 6755 is next to the K4. During my last trip, the 6755 was undergoing cosmetic restoration. Description: One of the most attractive faces in the history of railroading is put forth by the magnificent PRR M1b #6755, here on display outdoors at the Railroad Museum of Pennsylvania in Strasburg. Description: Across the street @ the RR Museum of PA, M1 "Mountain" #6755 & K4 "Pacific" #3750 are in repose. Description: This steam locomotive is very special to me, because my great uncle once operated this locomotive and basically owned it for a while. I am glad to see that it is still in existance. Description: A K-4 (Built 1920) and a M1 (Built 1930) displayed in the museum yard. Description: An M1 (Built 1930) on display in the museum yard. Description: One of the PRR Mountain types, good for hauling freight through the Allegheny Mountains of western PA.